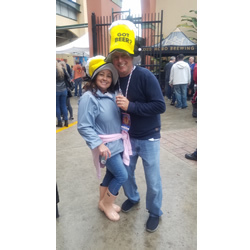 2019 Reviews of craft breweries, brewpubs, beer bars and beer festivals. "Storm's a Brewing?" 2018 brought change to the craft beer industry and 2019 will bring more. From new and different styles, different trends, business issues and more 2019 promises to be interesting to say the least. The year should show slower growth but still some, but not like 5 years ago. Overall beer sales were down sightly but craft increased by 5%. ( in 2017) 2019 should continue this trend; smaller growth at the expense of the big national brewers. Local will still matter; most smaller breweries have taprooms where they can sell directly to consumers and this will continue. Taprooms are a major source of money for many. There were closings and scaling back of growth plans in 2018. Green Flash is a good example of "biting off more than you can chew". The company was foreclosed and the east coast brewery was sold. 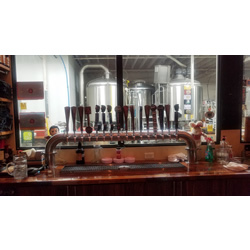 Mystery Brewing (NC), open since 2012 closed on October 31st due to lack of working capital. Still the industry chugs on...there are now over 7000 breweries nationwide. Most people live within 10 miles of a brewery. This is a huge change from just 10 years ago. Growth will now come from new customers from different groups than the past. Making the brewery taproom a fun place with different things to do will drive solid growth. The competition, even when friendly, will give us beer drinkers better quality beer and more choices. 2018 was the year of the Hazy IPA or New England IPA. These brews explode with juicy tastes and are less bitter than the traditional IPA. Almost everywhere I visited last year had a version. This years IPA will be the Brut IPA very 'dry' drinking and another evolution of the venerable IPA. The 'dryness' is accomplished using a brewers enzyme, AMG. The result is a light bodied beer with lots of hop flavor and alcohol sweetness. IPA is still the most popular style but new different styles are coming up. Pilsner and other light brews have come to craft. They were associated with the big brewers but all lager styles have now become popular in small craft breweries. The sour beer category will expand on the 'American Wild Ale' style. American brewers will change and adapt the traditionally Belgian sour styles for the new world. 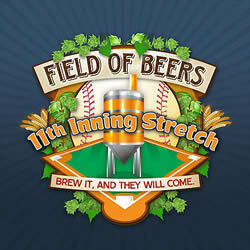 The Field of beers was in it's "eleventh inning stretch" and the festival in it's thirteenth year. Both went well with some rain at the festival for the first time in thirteen years! The rain didn't hurt anything; people made the best of it and still had a good time. At the FOB there were 15 stations with small bites of food paired with a special beer form each brewery. There were several memorable pairings. Kurobuta Pork Sliders paired with Funky Buddha Stick Nuts, a peanut infused blonde ale that tastes like peanut butter. Nearby was festival regular Rincon Heat a local hot sauce with fresh sucked oysters. New West Palm Beach brewery, Steam Horse had a "double play" with 2 beers; a light lager and a black lager. They were paired with Bauernwurst and Grainy Mustard German potato salad. Double the pleasure... Last but not least was the "Doughnut Forget" dessert and beer pairing all the way out the third base line. As always this was one of the best festivals; it's a tough ticket but well worth the effort to attend. Gulfstream Brewing Company - Fort Lauderdale, FL. LauderAle Brewing can be hard to find. After going in circles it was finally spotted from the nearby street. The nearby Port Everglades and the owners marine background make the seafaring theme of the brewery appropriate. Beer names, decor; even the sampler trays look like propellers. The place looks like a lot of fun; indoor and outdoors with many events happening all the time. We were closing the place down so it was fairly quiet on this visit. There is an outdoor stage for music and other entertainment. The next day the brewery was having a super bowl party with a big screen outdoors, food trucks and specials all day. We got the last few spots on the "squares" as we left. (To no avail!) I got a sampler 'prop' with 4 brews. Monkey Road Red Ale was a hoppy red ale with good malts in the background. 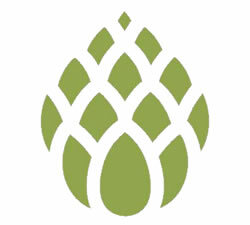 Hop Mess is a hoppy pale ale - a modern interpretation; almost an IPA. Immigration IPA was a New England IPA with lots of citrus tastes and aromas. This was my favorite of the night. Foxy Christmas Monkey was a dark spicy Christmas ale clocking in at 10.5% ABV. Another good Fort Lauderdale brewery with a big selection of beers all the time. An afternoon or evening here will be fun. 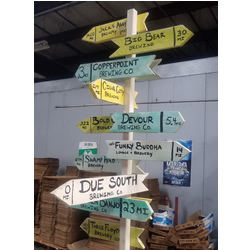 The website (LauderAle.co) has an updated beer list and an events page with upcoming events and food trucks. I first tried Orchid Island Brewing (OIB) back in 2013 at the Jupiter brewfest. They were just starting and trying the idea of making their beers reflect where they are from. Orchid Island was famous for the citrus grown there and that the weather favored it in not freezing ever. So, the idea was to put a bit of Orchid Island in the beers. That first year they put way too much grapefruit in an ale I tried. By the 2014 festival, the beer was greatly improved and I told them so. The people at the booth were good folks and learning the business. The brewery taproom would open later that year. Fast forward to 2019 and I (finally) made it to Orchid Island to try the beer and food. The idea of terroir is relatively new in the world of beer. OIB has nuanced it well and most beers have a bit of the island in them. The Grove to Glass project has produced some unique and tasty brews. OIB also has Farm to Table foods with local top quality food available along with the beers. I had a four beer sampler and tasted all six. The citrus is subtle and adds to the beers. My favorite was the Monster Hole Pale Ale and Star Ruby Imperial IPA brewed with ruby red grapefruit. The venue is a cool place with a fairly laid back crowd; Everyone was friendly and I met several locals who really like the place. OIB should be on any visitors list as the food and beers are great together. it's a bit off the beaten path and will worth visiting. See OrchidIslandBrewing.com for menus and hours.